For transparency, books and sites by Forum Trustees or Patrons are in dark green. The ecology of a garden: The first fifteen years. Jennifer Owen 1991. Cambridge University Press Very important scientific analysis, it changed our perception of the importance of gardens for wildlife. Wildlife of a garden: A Thirty-Year Study. Jennifer Owen 2010. RHS. Her more readable and well -illustrated follow-up. Pretty much required reading! Urban Ecology: Patterns, processes and applications. Jari Niemelä (ed) 2001, Oxford University Press. Thorough technical analysis of all aspects of city ecology and environment. The Biology of Lakes and Ponds. Christer Brönmark and Lars-Anders Hansson. 1998 Oxford University Press. pp216. Readable scientific introduction to the ecology of still fresh waters. Gardening for Butterflies, bees and other beneficial insects. Jan Miller-Klein. Saith Fynnon Books. Good on food plants and habitat creation by an ex-Trustee of the Forum. Plants for Bees: A Guide to the Plants that Benefit the Bees of the British Isles. W.D.J. Kirk and F.N. Howes. 2012 International Bee Research Association. 311pp. Important in dealing in detail with the needs of bumble and solitary bees as well as honey bees. The Book of Weeds: How to deal with plants that behave badly. Ken Thompson 2009 Doring Kindersley. Written in Ken’s inimitable style, a fun guide to garden weeds that makes you rather like them. My Side of the Fence: The Natural History of a Surrey Garden. Jeremy Early 2013. Published by Jeremy Early. 30 Park Lane East, Reigate RH2 8HN. Substantial and interesting account of one person’s garden observations. The Complete Garden Wildlife book. Mark Golley 2006 The Wildlife Trusts. A well-illustrated but rather basic introduction to the main groups. Guide to Garden Wildlife. Richard Lewington. 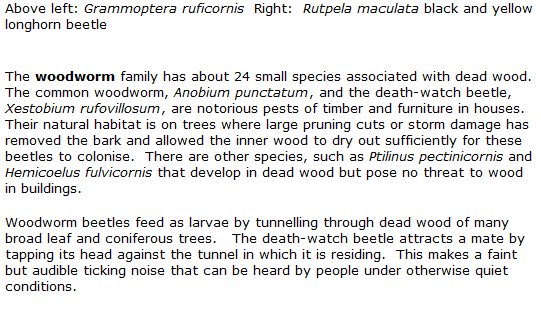 2008 British Wildlife Publishing. Small Freshwater Creatures. Lars-Henrik Olsen, Jacob Sunesen and Bente Vita Pedersen. 2001 Oxford University Press. Very useful basic guide. Wildlife Gardening with Jenny Steel. www.wildlife-gardening.co.uk Beautifully illustrated, useful sections and a blog. Jenny also runs courses and has published several short guides. OPAL (Open Air Laboratories Network) www.opalexplorenature.org A great web-based organisation helping ordinary people become citizen scientists and explore nature in their own area. Lots of guides and projects. Field Studies Council www.field-studies-council.org Lots of natural history courses and identification guides. Thanks to Anabel for recommending this! Please let us know of other good American websites to add.